Thirteen PC/104 Consortium members have combined to introduce over twenty-five Intel® Atom™ processor-based products, with more on the way. The dynamics of size, weight, power and performance are constantly shifting in the design of embedded computers. When one is using a standard board form factor there is little variability to the size and weight; only the power and performance can change substantially. The preferred relationship in most applications is to improve the performance while using less power. When it comes to computing modules, it is not often that this ratio can be improved. However, the Intel® Atom™ processor family makes this possible in new ways. At the same time, these processors are bringing some unintended benefits to existing computer board product lines. Intel introduced the Intel Atom processor family in 2009, focusing it initially on mobile applications. It offers high performance, industrial temperature (-40º to +85ºC) operation and radically reduced power requirements– all important to embedded computers. Its C6 state (Deep Power Down Technology) and Enhanced Intel® SpeedStep® technology bring power management capabilities missing in previous generations of processors. The Intel Atom processor two-chip solution with integrated memory and graphics controllers balances performance with very low power requirements, making fanless or conduction cooling easy to implement for small sealed enclosures. The performance-per-watt enables designs that can operate with less than 5 watts while still having the ability to run Embedded Windows and Linux. The processor also operates with other x86-compatible real-time operating systems, such as QNX and VxWorks, making it easier to migrate applications to the Intel Atom processor environment. The embedded computer industry quickly saw the merits of its low-power capabilities but without sacrificing the processing performance. As a result, Intel saw the potential and placed many of the Intel Atom processor variations on the embedded processor roadmap, ensuring a longer product life cycle – at least seven years – that is critical to many embedded computing platforms. Intel offers a variety of configurations with choices in cores, clock speeds, memory speeds and chipsets that enable optimum matching of capability to application needs. Combined with the appropriate chipsets, the processors have additional capabilities with graphics, display and expansion through PCI Express. Members of the PC/104 Consortium that develop processing modules quickly saw the benefit of the Intel Atom processor family and have used them to develop product lines with that improve the size, weight, power and performance dynamics so important to embedded computing. The first wave of PC/104 family products turned to the Intel Atom processor family to help with extending the life of existing products, providing an upgrade path for the large base of existing PC/104 system designs. Performance, range of interfaces and energy efficiency make the Intel Atom processor an ideal substitute for Intel® Pentium® M processor-based designs that filled many catalogs. A wealth of legacy I/O interfaces including ISA, IDE, serial and parallel ports, on-board video, RAM, USB 2.0 and PCI bus are supported and still help reduce the overall power consumption. Existing customers are looking to take advantage of the newest generation processors while preserving their investment in existing I/O technologies. The later releases of Intel Atom processors also bring new features that can enhance the newest board products. According to JC Ramirez, ADL Embedded Solutions Product Manager, “The graphics capabilities of the new Intel Atom processor D2700 are amazing and enable stunning visual quality. The Intel rated Thermal Design Power (TDP) maximum of 10 Watts, has increased clock speed and enhanced graphics including dual-channel video capability at full 1080P with full HD-Decode (MPEG2, VC1, AVC, H.264) and Blu-ray 2.0 support.” The dual-core architecture provides an always-needed performance boost. This brings functionality and performance to embedded computing platforms that matches the latest found on the desktop. 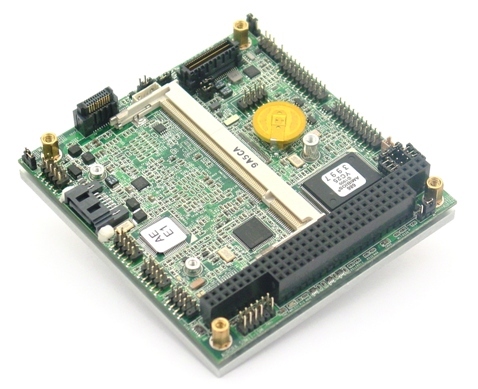 Many of the single board computer (SBC) suppliers are finding new homes for their products in applications requiring multiple display configurations with the integrated Intel® processor graphics, which supports both CRT and LVDS simultaneously on some models of the processor and chipset combinations. The Intel Atom processor also makes it easier to achieve a broader range of temperature operation, from -40° to +70° Celsius. Required in many industrial applications, these SBCs provide an open and powerful platform for processor- and I/O-intensive solutions. Fanless operation is possible much easier than ever before. New designs deliver plenty of I/O plus all the best features of the Intel Atom processor in a very compact, industry standard SBC. Today no less than thirteen PC/104 Consortium members have combined to introduce over twenty-five products using some component of the Intel Atom processor family, with new products being introduced each month. The most commonly used processor is from the Z5xx series. These processors were among the first from the Intel Atom processor series to be placed on the Intel® Embedded roadmap. These processors have a TDP maximum of 2 to 2.2 watts at up to 1.6 GHz making them ideal for systems restricted to low power requirements. The most recent announcements are being made that implement the D Series on the newest products. Currently, the most popular PC/104 form factor for Intel Atom processors is PC/104-Plus. Many of the suppliers have taken advantage of the capabilities of these processors to upgrade older lines with a lower power, high-performance processor, effectively extending the life of these product lines with the latest processor technology. The I/O payloads have remained essentially the same, making them backward-compatible with previous generations of products, preserving the legacy of products developed by customers using these platforms. At the same time, many products with PCI Express have also been configured with Intel Atom processors so that customers can upgrade systems with the latest in interconnection performance with PCI Express. Expect much more with PCI Express in 2012. The Intel Atom processor family has turned out to be a great enhancement for PC/104-based products. Rarely do you see such a great combination that energizes the product life of popular products and significantly boosts performance, lowers power, and extends the product feature list so extensively. Celebrating its 20th Anniversary, the PC/104 Consortium is an international organization working to expand the worldwide market for PC/104-compatible embedded products. Jeff Milde, CAE has served as the executive director for the PC/104 Consortium since 2000.